(J) Western blotting analysis of HIF1α abundance in response to 100 nM tofacitinib. Quantification of HIF1α detected by Western blot is shown alongside, with data normalized to SMC1 intensity and HIF1α protein abundance in IL-2-maintained cytotoxic T lymphocytes. Science, 2018, 11(526), doi: 10.1126/scisignal.aap8112. Tofacitinib (CP-690550,Tasocitinib) purchased from Selleck. Effects of CP-690550 on NKTCL cell lines. NK-S1, KHYG-1 cells were treated with CP-690550 for 48 hours, and the effect on STAT5 phosphorylation was evaluated by Western blotting. Cancer Discov 2012 2(7), 591-7. Tofacitinib (CP-690550,Tasocitinib) purchased from Selleck. AE cells were treated with vehicle control (DMSO), a MEK inhibitor (PD98059), a PI3K inhibitor (LY294002) or a JAK2 inhibitor (CP690550) at indicated concentrations for 24 hours, followed by lysis for immunoblotting. Blood 2012 120(4), 709-19. Tofacitinib (CP-690550,Tasocitinib) purchased from Selleck. (d) Immunoblots of indicated proteins in primary EITL cells treated with PD0325901, Tofacitinib and Trametinib for two and Stattic for 24 h at indicated concentrations. Leukemia, 2016, 30(6):1311-9. Tofacitinib (CP-690550,Tasocitinib) purchased from Selleck. TRAP-positive multinucleated cell differentiation depends on JAK and is inhibited by tofacitinib in vitro. Effect of tofacitinib on the differentiation of TRAP-positive multi-nucleated cells in vitro (n =3 wells/experiment). Original magnification x 100. Arthritis Rheumatol 2014 66(1), 121-9. Tofacitinib (CP-690550,Tasocitinib) purchased from Selleck. BMDM from wild time mice were incubated with the concentrations of Ruxolitinib (R) or Tasocitinib (T) indicated, then stimulated for 30 min with (+) or without (-) 500 units/ml IFNβ. The cells were lysed and 30 ug of cell extract protein subjected to SDS-PAGE and immunoblotted with an antibody that recognizes STAT1 phosphorylated at Tyr-701 (p-STAT1) and an antibody that recognizes all forms of STAT1. J Biol Chem 2012 287(41), 34825-35. Tofacitinib (CP-690550,Tasocitinib) purchased from Selleck. Effect of a panel of IFN inhibitors on BUNΔNSs virus growth in A549 cells. 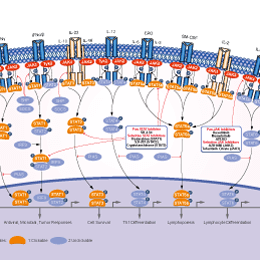 The inhibitor panel consists of small molecules that target the IKK2 (TPCA-1) and TBK1 (BX795, MRT6884, MRT6707) components of the IFN induction pathway and JAK1 (Cyt387, AZD1480, Ruxolitinib, Tofacitinib) a component of the IFN signaling pathway. 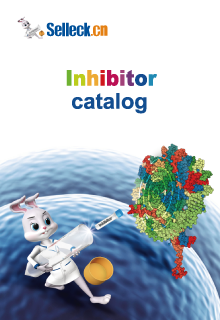 Effect of the inhibitors was compared with A549 cells constitutively expressing viral IFN antagonists that block IFN production (BVDV-Npro) or IFN signaling (PIV5-V). Effect of various inhibitor concentrations on plaque size formation. Plaques were visualized 2 days post-infection by crystal violet staining. PLoS One 2014 9(11), e112014. Tofacitinib (CP-690550,Tasocitinib) purchased from Selleck. Role of tyrosine kinase Jak2 in NHE1 activation. Mean (WSEM) pHi increases upon introduction of 350mOsM medium with AG490 (example shown in C), Jak Inhibitor I (Jak Inhibit I; 1uM), CP690550 (1uM), and control (vehicle alone, with 0.1% ethanol for AG490, 0.01% DMSO for Jak Inhibitor I and CP690550). Bars that do not share the same letter are significantly different by one-way ANOVA and Tukey–Kramer Multiple Comparisons Test (P < 0.05). Tofacitinib (CP-690550,Tasocitinib) purchased from Selleck. Changelian PS, et al, Science, 2003, 302(5646), 875-878. Kdlacz E, et al, Am J Transplant, 2004, 4(1), 51-57. Kudlacz E, et al, Eur J harmacol, 2008, 582(1-2), 154-161. Yoshida H, et al, Biochem Biophys Res Commun, 2012, 418(2), 234-240. Borie DC, et al, Transplantation, 2005, 80(12), 1756-1764. Kudlacz E, et al. Am J Transplant, 2004, 4(1), 51-57. I was just wondering what the main differences between S2789 and S5001? S2789(Tofacitinib (CP-690550)) is the base form of S5001 (Tofacitinib (CP-690550) Citrate). The biological activity of these two compounds are same. The S5001 (Tofacitinib (CP-690550) Citrate) is more suitable for oral administration.